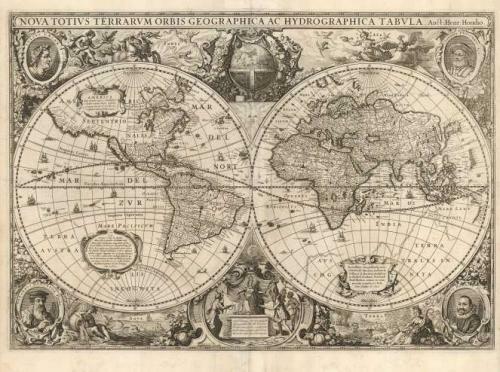 Title: ' Nova Totius Terrarum Orbis Geographica ac Hydrographica Tabula'. Printed in Amsterdam. German text on verso. This is the second stateof the Hondius world map issued after 1641 with the imprint of Jan Jansson added at bottom. A beautiful map featuring hemispheres surrounded by voluptuous representations of the four elements: Fire by Apollo driving the Sun's chariot across the sky; Aeros, the goddess of Air, surrounded by clouds and birds; Mother Earth, surrounded by animals and the earth's bounty; and Water represented by a Siren and sea monsters. Tucked between the hemispheres are a celestial globe with the figure of the sun at the top, and a scene of Europa receiving tribute from Asia, America and Africa with a figure of the moon at the bottom. Four portraits fill the corners: Julius Caesar, Claudius Ptolemy, Jodocus Hondius and Gerard Mercator. The scenes are all beautifully linked together with a rich garland of fruit. In North America California is shown as an island with a westward stretching coastline labeled Nova Albion. This coastline contains many place names including C. Mendocina at the far western edge of the map. Queen Anne's forland (Baffin's Island) is completely surround by water on the northeast coast of Canada. The Dutch discoveries on the Carpentaria coast of Australia are included, but there is still only a faint outline of Terra Australis Incognita with Beach Prov. left floating in the Indian Ocean. A fine impression with a bit of minor light soil. Expert minor repairs on centerfold.